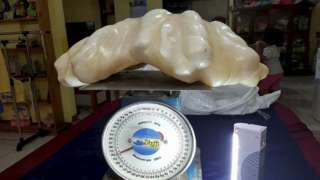 Puerto Princesa City, Philippines -- A Filipino fisherman in western Palawan island has found a giant pearl measuring 30 cm wide (1ft), 67 cm long (2.2ft) and weighing 34 kg (75lb), which sets the new world record for the Largest natural pearl, according to the World Record Academy. The fisherman and his family decided to turn over the pearl to the city mayor, who had it displayed in a glass case in Puerto Princesa's city hall to attract tourists. The fisherman will receive a still-unspecified reward from the local government. The current largest known pearl in the world was found in Palawan sea in the 1930s. The Pearl of Lao Tzu, previously known as the Pearl of Allah, weighed 6.4 kilograms.